The import of Chinese white wares and the high-fired porcelains into Iraq in the ninth century led the local Arab potters to experiment in reproducing the whiteness of the Chinese originals in their own low-fired pottery. The Iraqi pottery body fired to a yellowish bluff colour, and one of the ways the potters developed to make this look white was to cover it with a tin-glaze - a glaze which is made white and opaque by the addition of tin-oxide. This tin-oxide also reflected the eastern trade links of early Islamic Iraq, for, with no tin mines in the Islamic Near East, the metals had to be imported by sea from southern Burma and Malaysia. 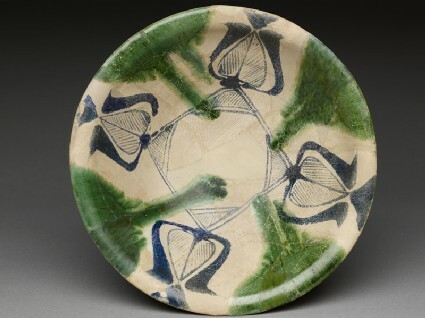 Occasionally the Iraqi potters were content to leave their products completely plain, like the Chinese originals, but more often they preferred to decorate them, using the white as a ground for the blue (cobalt) and green (copper) designs. These two bowls [EA1978.2137 & EA1978.2141] illustrate four decorative themes typical of early Islamic pottery. The first, which appears on both pieces, is the palmette, traditionally a five-petalled blossom, from which the later ‘arabesque’ derived (see no. 9 [EA1956.130]). The second is geometry, the central part of the design of the lower bowl being made up of a square within a diamond. The third is stylisation: in the second bowl the highly stylised palmette is about as far from its natural parent as it could be, illustrating a taste common in the Islamic painting tradition as well as in ceramics. 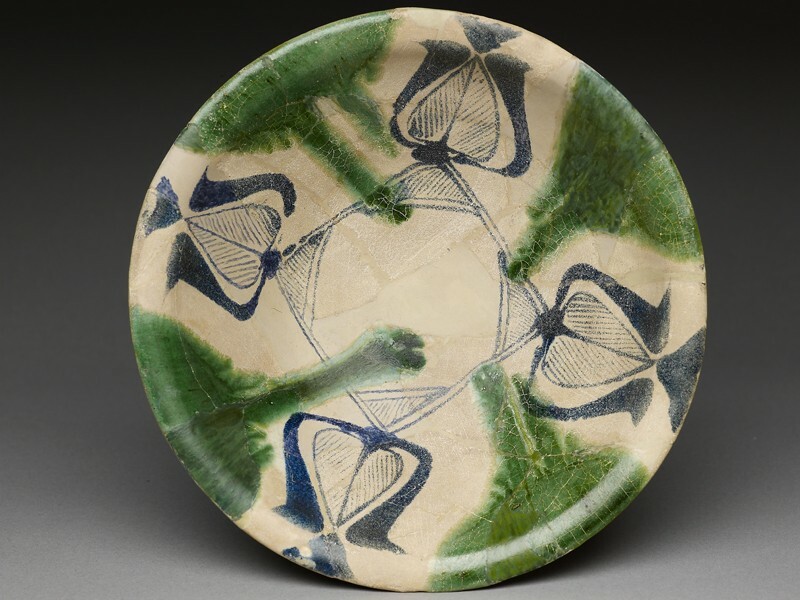 Fourthly, the second bowl is decorated with green splashes, a taste common in less expensive pottery objects in areas stretching from Egypt to Iran during early Islamic times (see no. 5 [EA1978.1759]).